When I went to the cinema one evening in 1993 l, I could not estimate the impact on my life that this evening would have. I can't recall the movie of that night, but I did recall a trailer for a movie about the battle of Gettysburg. As soon as the VHS tape came out, I bought it and watched it. Then, I watched it again. And again. The movie is called "Gettysburg" by Ronald Maxwell, starring Martin Sheen, Tom Berenger, Jeff Daniel, Kevin Conway, Sam Elliott and the later Richard Jordan in his last movie. It was based on the book "Killer Angels" by Pulitzer Price winner Michael Shaara. Soon after this, I also got the book from a library and read it through, found it equally compelling than the film and decided I wanted to know more about the American Civil War. I then joined the Civil War Forum in Compuserve in order to find out more. I found a bonanza of information and some friends for life. And I got the distinct impression that it would be worth going there and to see the place in reality and to hear how the battle really happened. So in summer of 1998 the opportunity arose when I went to attend the 1998 Microwings Flight Simulation Conference in Orlando, FL. 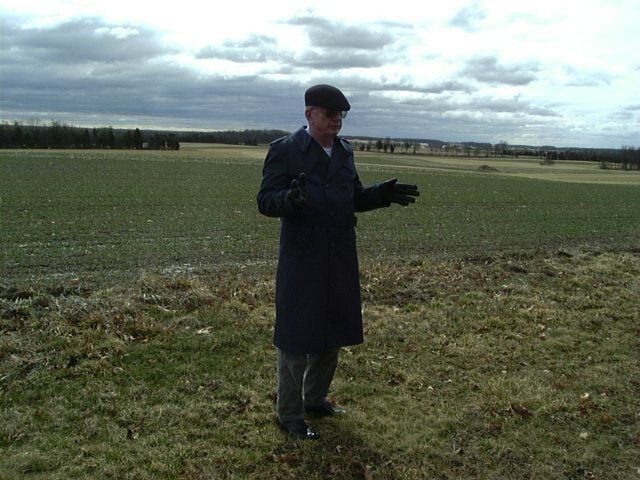 I decided I would fly into Washington and take four days off to tour the battlefield with one of the forums scholars of the battle, Lt. Col (ret) Wayne Wachsmuth. To say that this 3 day tour with Wayne changed my outlook on things is putting it mildly. Wayne knows just about all there is to know about this battlefield and then some, more anyhown than could be packed into the time available. I bought quite some literature on the subject and started to explore the battlefield on my own. I was back in Gettysburg for the 98' memorial day weekend in November and had the good fortune to meet many Civil War Forum participants there at the parade and dinner. Apart from that, I had time to tour on my own again and to have a closer look around the town. Gettysburg, Pensylvania, is a great town to visit even for non civil war buffs. The Lutheran Seminary, which was already standing in 1863, rules the town and is a stately view from all sides. 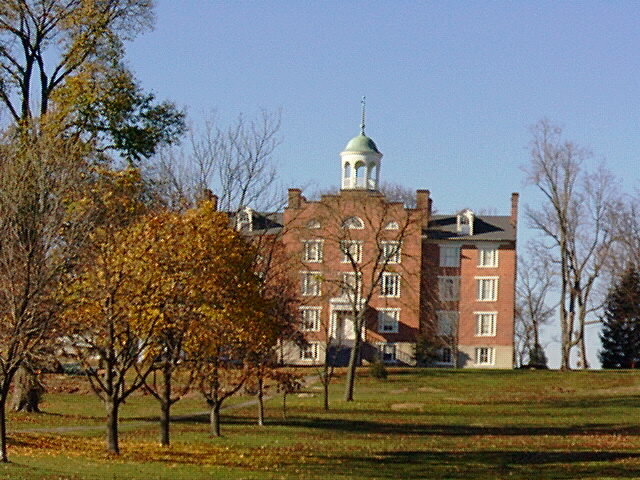 It was reportedly from the tower of the Old Dormitory (pictured above) that Union General Buford observed part of the first day action to his west. The town center is full of periode houses and lovely to take a stroll in. Around the main square, statues of Pres. Lincoln, whose "Gettysburg Address" is remembered every year with the said memorial day weekend (around Nov. 19) and other attractions are waiting to catch the eye of the visitor. For those interested in shopping, there is a collection of shops in town selling all sorts of merchandises, galleries, bookstores and many other venues. Culinary places are there by the dozens starting from typical fast food like KFC and Mc Donalds to fine dining at Farnsworth House or Dobbin House Tavern. In 1999 I was back in Gettysburg for the memorial day dinner and parade. I met many new faces that I had not seen before and managed to attend a yearly event held by a regiment of reenactors (or living historians as they prefer to be called) on Little Round Top. It was here I met Brian Pohanka, a historian really living history, who had an active part in the movie as well as in others like "Glory" , the prequel to Gettysburg called "Gods and Generals" and, more recently "Cold Harbour". 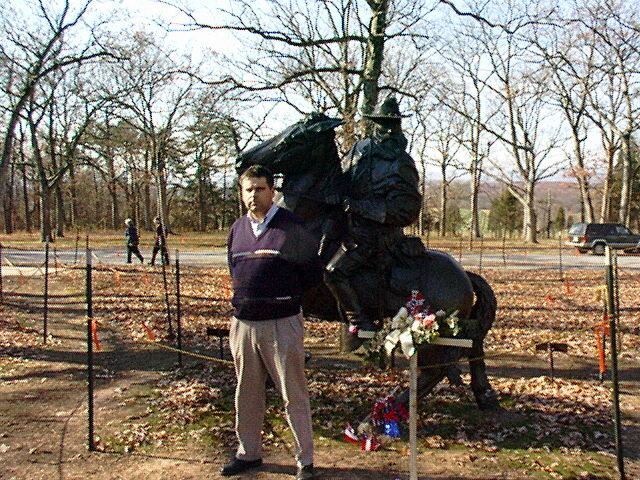 Brian is the author or co-author of many books and heads the reenactor Fifth New York Regiment of Zouaves. 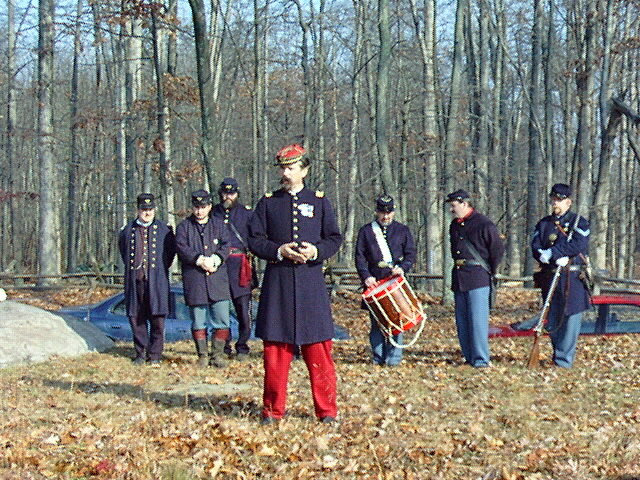 He pointed me to a second ceremony held the next day in memory of General Zook, who died during the battle. 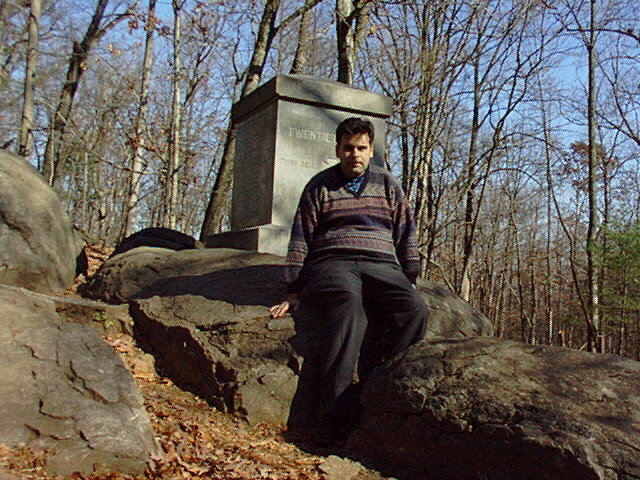 In March 2001, I was fortunate enough to attend the annual conference of the Civil War Forum there. Again, we had the priviledge to be guided in a 3 day tour by Wayne Wachsmuth. Having done the previous tour with him, this one went a lot further and really in depth of the happenings on the fatefull days in July 1863. Again I had the chance of meeting many more of the people I had previously only known through the net. A rewarding experience to say the least. The battle of Gettysburg took place on the first 3 days of July 1863. The Confederate Army of Northern Virginia, Gen. Robert E. Lee commanding, had started a campaign into the North in order to draw the Union Army of the Potomac out of Virginia and to meet them for a decisive battle somewhere north of Washington. The ANV, under command of Gen. George G. Meade, proceeded behind the Blue Ridge Mountains and was followed by the AOP. General Lee was informed of the presence of Union Cavalery and decided to concentrate his troops in the area of Gettysburg. 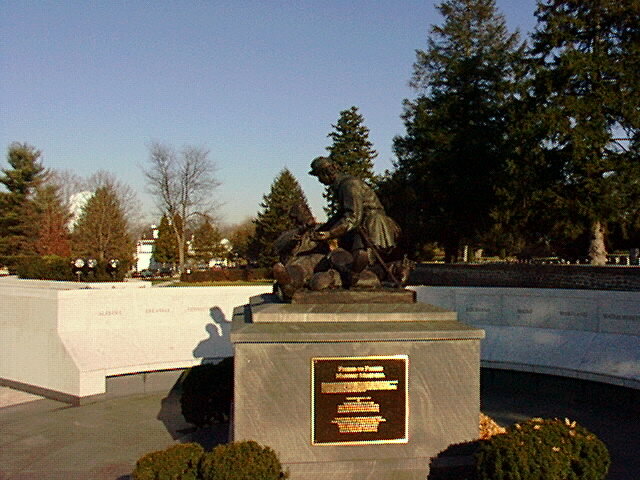 Gettysburg is located in a rural area of Pennsylvania, a cross road town. From the North, roads from Harrisburg and Carlisle as well as York meet there, to the east, Hannover Road and Baltimore Pike lead in their directions, to the South roads lead up from Taneytown and Emmitsburg. 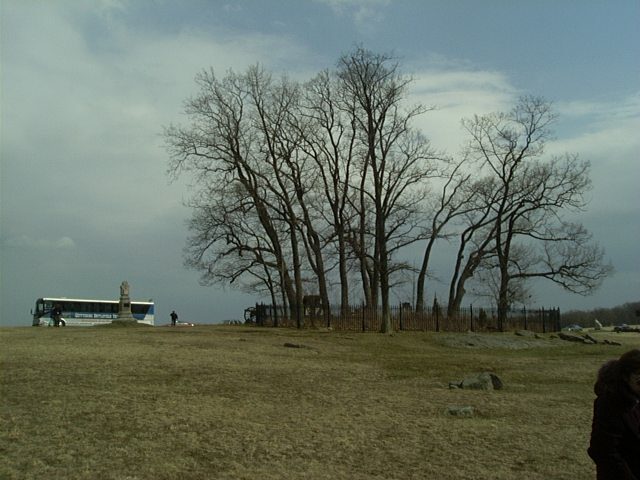 There are two ridges east and west of Gettysburg, Seminary Ridge (named for the Lutheran Seminary) to the west, Cementary Hill up to the Round Tops to the east. On July 1, Bri. Gen. Henry Heth CSA, of Gen. A.P. Hill's corps, took a reconaissance patrol towards Gettysburg to find some much needed footware for his soldiers. He was met by Union General John Buford and his two brigades o cavalry. The skirmish that followed that surprise turned into a full battle. 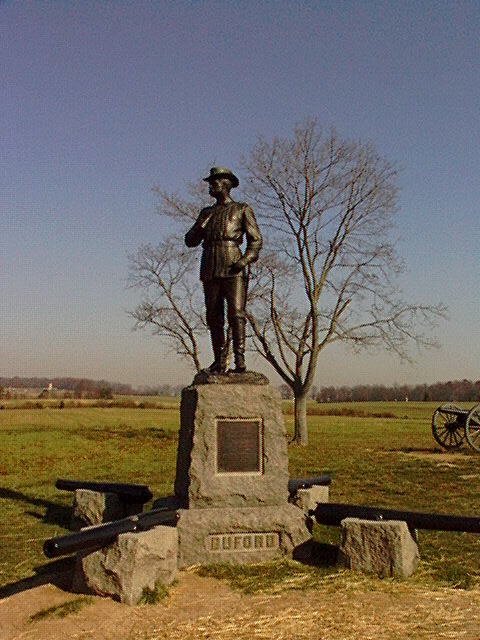 Buford held against overwhelming odds until the First Corps including the famous "Iron Brigade" under the command of Gen. John Reynolds arrived on the scene. They quickly deployed and so when Gen. Heth started an all out attack, expecting to overrun the cavalry, he was met by the full force of the First Corps. General Reynolds himself was killed in the early stages of the engagement by a sharpshooter. Nevertheless, the Union troops managed to hold off the attack. In the mean time, General Richard Ewell's 2nd Corps had arrived upon Gettysburg from the North. Gen. Jubal Early's division started to attack the right flank of the Union troops. The latter were during the afternoon driven back towards a hill in the east of the city with a prominent cemetary on it, hence the name "Cementary Hill". General John Buford, US Cavalry. On July 2nd, it was General Lee's aim to attack and defeat the AoP. He came up with a plan that had Ewell's 2nd Corps attack from the North and General James Longstreet's 1st Corps from the South, attacking both flanks of the Army of the Potomac. The attacks however did not go very well. Longstreet was delayed to reach his positions as he found the Round Tops occupied by Federal forces and was forced to countermarch and then march back again to reach his position, which cost valuable time. In the mean time, Ewell's attack on Culp's Hill did not succeed. When Longstreet's divisions finally attacked, they succeeded in driving the Federal Forces from landmarks today known as the Peach Orchard, the Weathfield, the Valley of Death and Devils Den, but with a great number of casualties. Finally, when troops of General Hood's Division were stopped and thrown back at Little Round Top, the attack failed finally. 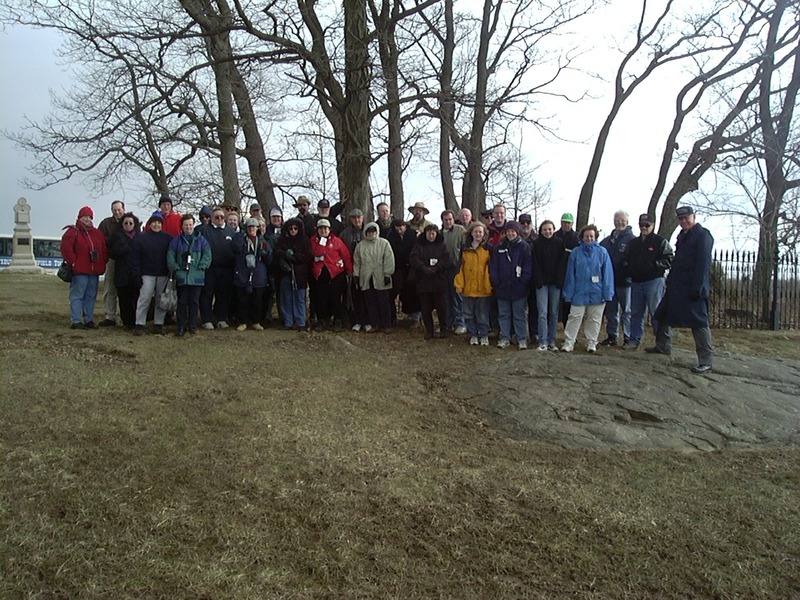 It was Little Round Top that brought fame to a small regiment of infantry from Maine. The 20th Maine Regiment, lead by Col. Joshua Lawrence Chamberlain, were placed on the far left flank of the Union lines. They successfully repelled several attacks by the Alabamian Regiment, before running out of ammunition. Chamberlain then decided to mount a Bajonett Charge to finally repell the enemy and succeeded. This day won him a place in the history books, as well as later a Congressional Medal of Honour. Chamberlain ascended to Brigadier General before the end of the war and was wounded severely. It was him that received the parade of the Confederate Army after the surrender at Appottomax in 1865. In the weathfield, an officer by the name of General Zook was mortally wounded during the battle. When I attended Memorial Day in 1999, Capt Brian Pohanka of the 5th New York Regiment and the actor that had played Zook in a TV series met in a moving ceremony. General Zook's Sword, missing since the battle, had been located and on this day was returned to the General in this ceremony. Having withstood the UnionArmy for 2 days, General Lee sought a decisive attack. He ordered General Longstreet to plan an attack on the Union Center on Cementary Hill, which he thought to be the weakest point of the line. He defined this point as next to a "clump of trees yonder" on Cementary Hill, today known as "the angle". Longstreet ordered the division of Major General George Pickett to lead the attack, enforced by 2 additional brigades of GeneralA.P Hill's corps. Headed by Generals Armistead, Garnett and Kemper as well as Generals Trimble and Pettigrew from A.P Hill's Corps the brigades lined up on Seminary Hill in preparation for one of the bloodiest attacks of the Civil War. Before they set off, a "feu d'énfer" cannonade was started under the command of Col. Porter Alexander, the artillery commander of the 1st Corps. He shelled the position until he started to run out of shells. Then, the 5 brigades set off on their deadly march. The attack was repelled with horrendous loss of life. Some of the men of General Armisted's brigade managed to penetrate the Union lines, but were quickly overcome by overwhelming forces. Armisted was wounded severely and died the next day in a field hospital. Garnett's body was never found, Kemper was mortally wounded. The spot where Armisted was hit is now marked at the Angle. All in all over 15'000 casualties resulted from this horriffic battle. The Marker of General Lewis Armistead's Death. 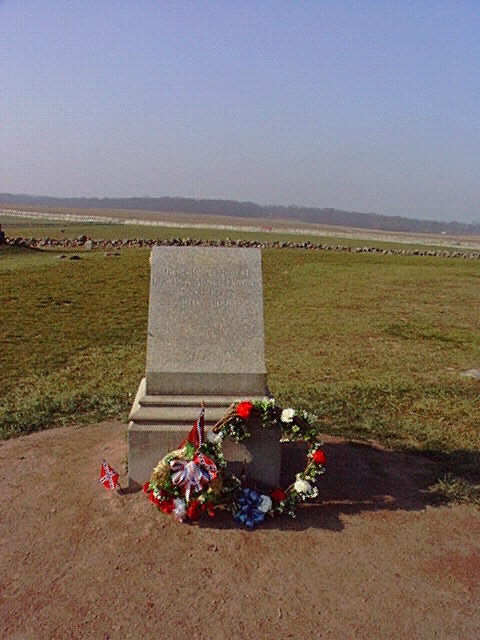 The scene of Armistead's wounding was captured in this monument south of the National Cementary, wheren many of the battles casualties were buried. Thanks to the good people of the Civil War Forum I became aware of the controversy about erecting a monument to General James Longstreet. When it was finally erected, I made it a point in going there and seeing it. Longstreet has often been blamed for the defeat of the Confederate Army of Northern Virginia at Gettysburg, but it remains to be said that, had the General had his way, the battle would probably never have happened or would have taken another turn. After the war, Longstreet was amongst those who advocated reconsiliation and was branded as a traitor by many Southerners, yet he sought the good of his own people. Lee, the commander in chief of the Army of Northern Virginia, referred to him as "My old warhorse" and remained close to him until his death. It was through the relentless efforts of the Longstreet Society and many dedicated individuals, that General Longstreet is finally back in Sprangler Woods on the Battlefield. My dear friend Margareth Blough presented me with a t-shirt one day at Gettysburg. It sais: "Old Pete's Back in Gettysburg" on the front and "It's About Time" on the back. I wear it with pride to this day. Behind the Stonewall A unique view of the Gettysburg through several 360 degree cameras. The Longstreet Society Website dedicated to General James Longstreet.